I have this very bad habit of eating steam bun or we Chinese called it Pau. I will break the pau into half and then start digging out all the fat meat. As you know most of the pau at the dim sum place has a lot of fat in it. So the best is to make it myself where I can put whatever I want for the filling. I made 12 of these and will give some to Diana so she can just steam them and eat it before going for her class. 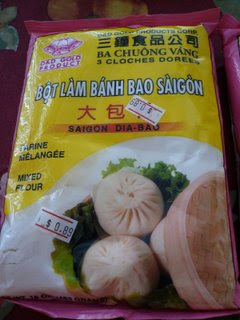 I used this ready-mixed steam bun flour for the dough. You can get this at Asian Store. 14 piece of square greaseproof paper - about 1 1/2" x 1 1/2"
1) Prepare the dough according to the instruction on the ready-mixed flour. 2) Heat up oil and stir fry garlic and onions until lightly brown. 3) Add in BBQ meat, hoisin sauce, soy sauce, sugar, salt and pepper and stir fry until well mix. Add in the water. Lastly add in green peas. 4) Add in the cornstarch solution and bring to boil again. Dish out and set aside to cool. 5) Divide dough into 12-14 pieces and roll into a ball. Flatten it and put a tablespoon of filling and seal the edges. Put the bun on top of the greaseproof paper and set aside to proof for 15 minutes. 6) Prepare a steamer with rapid boiling water and steam the buns for 20 minutes. Labels: Asian Snacks, Bread, breakfast, Dim Sum, Pork. Interesting fillings. It looks delicious.Yummy! Ada tak resipe yang tak ready mix dough. pernah buat dulu tapi jadi bantat..
Gert,your pau look so good like the restaurant one! !.I almost make pau last weekend but don't have time,friend come to visit.I bought some pau powder from KL.Today I took out Agnes Chan recipe book for pau,thinking to make char siew pau but too busy preparing icing and cake for my class,so maybe tmorrow.Now looking at your pau motivate me to try my hand on it.Hope I can make mine as good as your:). oh your filling looks delicious. like really really good! Gosh..I want some Char Siew Pau...nowww!!! my dearest gert, i love LOVE LOVEEEEE pau! i only eat pau kacang merah. looks like i have to go (maybe cycle!) to our toko and find that ready made mix. but how to make the kacang? susah sangat, buat kari and kentang lah! did you mention BBO meat? wow! Am I thinking what I am thinking? lol! I am too lazy to make them. I will just pop to the food court to get. And I will also dig out all the fats in them. Ummi, I do have recipe of pau. Give me your e.mail address and I will send it to you. Tigerfish, can you get this kind of flour in Taiwan? The juicy succulent fillings got me salivating! I used to help my mom make this pau too, and once they're done, I will be the first to grab one and eat it. Hot, yes, but delicious too! gotta get me some of that! yummm!!! Gert, I'll save this recipe, hope one day all my darlings lucky enough to eat choy's homemade pau. Where to but those 'paper' ah? Rita, easy for you. Just grab some from the dim sum place in HK. Choy, you can get the greaseproof paper or parchement paper at the supermarket. Check out the cake ingredients aisle. I'm like you also. Every time eat pau will have to dig for the fats first. That's why I don't want to eat pau from outside. Every time I want to eat pau, had to make it myself. You've got a nice blog. I did tried a few of your recipes and all success. I'm so glad I came across your blog. You have so many mouth watering recipes that its actually making me hungry at work. I've always wanted to make Steam Buns (Pau). Thanks for this recipe. I made it and it came out delicious! Everyone loved it. Hello, I could not find the bread flour mixture . CAn i use the rice flour instead ? Hi, i can't find pau / HK / bread flour mixture. do you have a recipe to make dough from plain flour or cake flour? Anon, the recipe for the dough using regular flour is here.